It's that time of the year again for the Dare to Get Dirty Challenges at SCS!!!! Yeah!! This week is a week all about the members of the Fan Club and the only way you can participate in the challenges is if you're a member. 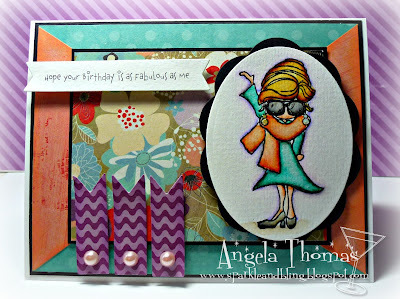 I have made this card for the DTGDblondie090277 challenge. The image was stamped in Versafine Onyx Black, embossed with clear embossing powder and then watercolored with Tombow Markers. The DP is a combination of Basic Grey, Bo Bunny and Pebbles. The stamp is called Addy'tude from Stamping Bella. Now pop on over to SCS to check out all the fantastic challenges that the Dirty Dozen and DD Alumni have in store for you.